Confidently and quickly run and gun in the world of wireless audio with the Rode Wireless GO, an incredibly compact true wireless microphone system offering secure Series III 2.4 GHz transmission and easy operability for mobile journalists, videographers, and vloggers of any experience level. The system is ready to go at the press of a button; you can focus on getting the shot knowing that the Wireless GO is delivering broadcast-quality audio at a range of up to 230 feet. There are no menus and no finicky dials, just simple power-on-and-go functionality and a bright, informative LCD screen showing you what you need to see. Capture top-notch audio quality even if you don't have an external mic; the Wireless GO is a complete system comprised of a miniature clip-on transmitter with a built-in, broadcast-grade, true wireless omnidirectional microphone capsule, a miniature clip-on receiver, and a slew of accessories—everything you need to get up and running in the field. Clip the transmitter onto your subject's clothing or belt, clip the receiver near your recording device, then connect the receiver's output to your recorder's input; whether you use the transmitter's convenient and high-caliber integrated mic or hook up your own lavalier (such as a Sennheiser 3.5mm jack–equipped lav), you're assured to achieve clear, crisp, intelligible audio. Equipped with a high-caliber, pre-polarized, omnidirectional lavalier built into the transmitter's compact housing, the Wireless GO delivers broadcast-quality audio without demanding an external microphone. Already have a top-of-the-line external lav? The transmitter packs in a 3.5mm TRS input with plug-in power, so you can connect most 3.5mm jack-equipped lavalier microphones such as ever-popular Sennheiser lavs, and still enjoy the convenience of the Wireless GO. Note: For optimal performance from this 2.4 GHz system, users are encouraged to maintain as direct a line of sight as possible between the transmitter and receiver. The receiver's 3.5mm TRS output sends a mic-level signal, making it compatible with an array of devices such as DSLRs and portable audio recorders. Includes SC2 right-angle 3.5mm TRS coiled cable for compatibility with DSLRs. Plug into your smartphone or tablet via an SC7 TRS-to-TRRS cable (available separately), or snag a VXLR adapter (available separately) for hookup to an XLR-equipped video camera or audio recorder. Includes two USB Type-C to USB Type-A cables for simultaneous charging the transmitter and receiver. Box Dimensions (LxWxH) 6.0 x 4.1 x 2.0"
Wireless GO Compact Wireless Microphone System (2.4 GHz) is rated 4.7 out of 5 by 11. Rated 3 out of 5 by peter from RF interference with plug in mic First the good. Love the very small size and how easy this is to use. Now the not so good. The built in mic on the transmitter is not great quality and sounds a bit tinny or thin to my ears. The biggest problem I am having is when I plug in an external mic, the RF interference rejection is not good. With a lavalier mic clipped near your shirt collar with a decent length of cable I am hearing RF interference from the microphone even when the transmitter is clipped to your belt or in your pocket. The closer the mic is to the transmitter the worse the interference. Very disappointed in this. Rated 5 out of 5 by Michael from Almost too easy to use and get great results The wireless go took about 10 seconds to set up, turn on, and immediately start recording. The results it provided right out of the box with the onboard microphone were far better than what I was expecting especially at this price range. The sound quality with the sony a7s ii provided clear sound with great range and little to no noise to be heard. Designing the receiver clip to also double as the shoe adaptor was brilliant. It keeps the profile small and its one less thing I have to worry about. I will very likely be ordering a second one to record two person interviews. The only thing that would be nice is to include the $10 xlr adaptor with the kit but Im only saying that because I forgot to order it at the same time. Rated 5 out of 5 by Artem from Outstanding! Exactly what I always wanted for family videos. Small, easy to use and with built-in mic! No more AF noise (even external mic doesn’t help). I like it more than lav mic cause it still picks up ambient noise so sounds more natural. Very loud sound, I have to use the lowest db setting on the receiver (use it Canon 5d iv). And even then I have to enable attenuator. The sound quality is great - thick and solid. I wonder why the receiver couldn’t be powered from the camera itself through 3.5mm cord like rode micro? Overall, this product is excellent for a shockingly low price. I would have paid $300 w/o hesitation. At $200 - it is must have for everyone who does even occasional video (family, hobby, wedding, vlogging, interview, etc.). Great for recording yourself while preparing for something (presentation, job interview, etc.). It is a game changer for the industry and I expect to see lots of (inferior) copycats. Rated 5 out of 5 by Preston from The best wireless mic for no hassle on the go use Pros: The audio quality is outstanding on this mic. The ease of use is 10 out of 10. The features do not leave you wanting. Cons: The wind muff (dead cat) that goes on the unit does not stay in place. The optional 3.5mm mic jack does not have a locking option. Conclusion: The pros far out weigh the cons, and really the cons may not be an issue for some at all. This is a must have addition to any film-makers kit, regardless of skill level. Rated 5 out of 5 by Ted from Worked fine right out of the box There arent many instructions, but you dont need them. Both sender and receiver have built-in rechargeable batteries. Connect each to a USB port with the included cables. Push the button and they pair quickly and transmit the audio. I tested with the built-in mic and also an external one. Both were fine. I didnt test how long they hold a charge, but if they are as good as claimed, they should last until after my Sennheiser wireless is well into its second set of 4 AA batteries. Rated 5 out of 5 by Joseph from Wireless GO is GREAT Right out out of the box and I was good to GO! This system is easy to use and sounds great. I got it to add to my Rode Filmmaker kits. With my SmartLav+ and the Rode VXLR I can run this additional lav into my MixPre 3. The units were paired right from the start and the built in mic is a nice feature. I love Rodes quality & innovation. This should be in everyones kit for an on the spot interview. Rated 5 out of 5 by Scott from Best wireless development of the year. I pre-ordered the Rode Go and got it today. I turned it on and plugged it in to my Canon 70D right out of the box. The sound quality from the transmitter mic is outstanding. I hooked up my Countryman B3 and got great lavalier audio without any fiddling. I have several Rode setups and am happy with all of them, and this is the coolest. The only thing is that it is so small, I fear I may misplace it! Can it function as a stand alone capture device? Hello Cristian, if by standalone capture, you mean that it records on the Wireless Go, the answer is no. This is a standard wireless receiver and transmitter meant to plug into an external recording device. 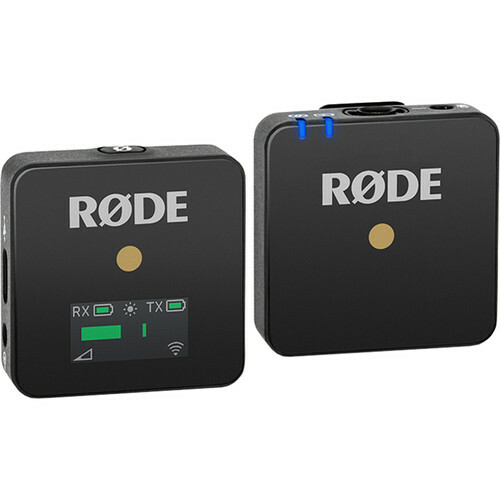 Can I use my (screw in type Lavalier mic) that comes with my R&Oslash;DELink Filmmaker Kit with the Rode Wireless Go? The lav should still work, but it will not screw down and lock. Can you use 2 channels, and stack the receivers on top each other? Hello Gavin, this depends on what you mean by stacking. The Wireless Go is a 1 to 1 wireless system. This means you will run one transmitter into one receiver. Does this transmit in stereo or mono? I was wondering if I could wirelessly transmit a music track source instead of a voice subject. Hello Josiah, this is a mono microphone level device and not meant for stereo headphone level or stereo line level input. Hello Michael. You would need two shoe mounts, one for each receiver. Two R&Oslash;DE SC7 cables and the new R&Oslash;DE SC6-L to plug into the phone. Note that this will sum both microphones into mono. Is there an easy way to mount this in the hot shoe of a DSLR? Yes there is. The included clip also doubles as the hot shoe mount. It will slide right in! What does &ldquo;up to 8 mics on set&rdquo; mean? &ldquo;Operate up to eight systems simultaneously for more complex setups&rdquo; So it is 8 mic (transmitter) &amp; 8 receiver setup. So if you wanna use 8 microphones you need to buy 8 pairs, so 1600$.. Very cool product, it would be even better if one receiver could operate with two microphones for a classic interview setup..
Can it record internally to a MicroSD card?